Wow Greliz, that’s really HEAVY. She’s called like my hometown. By the way the bad puns just reached maximum capacity, to made ’em worse would be the doom of all of us. There really should be precautions in place for magically superpowered aggressors. Fantasy settings always kinda drop the ball on this. Precaution in response to a display of hostility? Pardon but who barged in past all the security and guards – wait where are all the guards that are supposed to stop attackers, assassins and encyclopedia salesmen from getting in in the first place? So are we seeing a declaration of war or conquest since she arrived unopposed? Valencia’s arrogant and thinks she’s entitled to be there because her father was summoned. Nevermind the fact she barged in unannounced, she thinks it’s perfectly within her rights. a) how is it possible to manipulate gravity like that? b) how is it possible to make yourself immune to the effects of increased local gravity. c) is it effects or affects, I can never remember? There is a lot to be explained here! a) Gravity In A Can, found in your local grocer’s freezer!! …nah, it’ll be touched on next page. b) They can localize the space affected, Valencia’s just standing on the edge of it. I can’t wait for the update where those two get their bottoms kicked in. Should be two years or so. 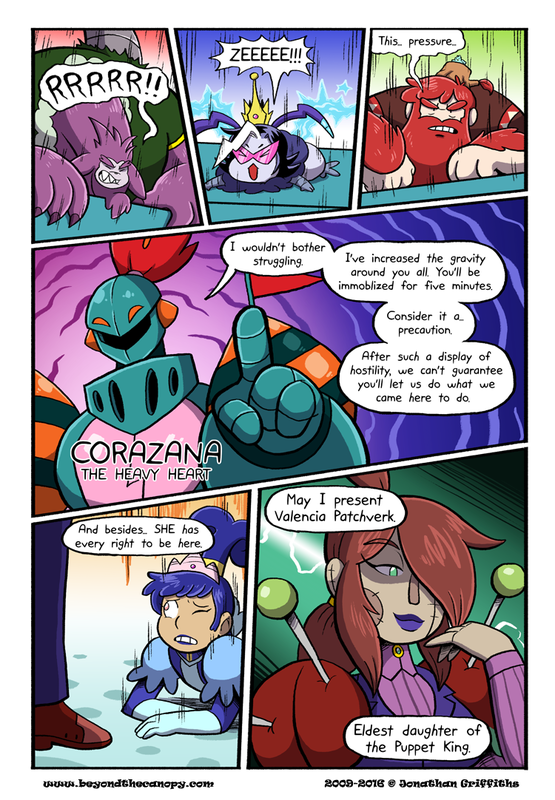 I figured there’d be a heart joke when I saw her name was corazana. I’m sure this transgression will be quickly forgotten. Unless, of course, war were declared. Heavy heart, I love it. Also, Corazana isn’t tagged in this page, btw! Our condolences go to the runner ups for the title, who we are told may one day regain control of their limbs.